The Subaru Stella is a mini car that Subaru exclusively sells in the Japanese market and it’s starting to catch on. Did you know Subaru has a Mini Series of automobiles? The Stella (which stands for “star” in Italian) is a reference to the Subaru logo. It’s a compact car introduced in 2006 which is as upgraded version of the Subaru R2, another mini car launched in 2003. I personally believe this mini series from Subaru should be sold here in the U.S. and other global markets and I think it would sell well. 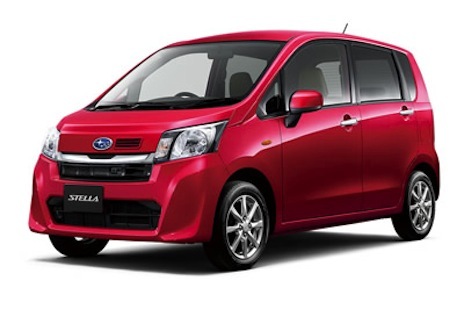 The Stella and Stella Custom is a product that is a joint venture between Subaru and Daihatsu Motors. Sales of the mini series has increased recently, and Subaru just announced the mini vehicle sales posted the first year-over-year increase in 5 months. Total Japan sales rose from the previous year for the 6th consecutive month. The Stella is powered by a three-cylinder turbo engine which could make it a good fit for the U.S. and other global markets. It gets a new "LS / LS Smart Assist" that will improve the Stella series as a whole. It uses a DOHC 12 valve intercooled turbo similar to the turbo engine of Stella custom. The new series is being released in Japan today. The upgrade "LS / LS Smart Assist" uses an idling start/stop feature that will make it more fuel-efficient than before. It also gets a new “3 eye” luminescent tachometer for the stylish and sporty interior. In addition, all Stella models will feature a new emergency stop signal in the rear to alert for sudden braking. The Subaru Stella will also get two new exterior colors and will come in "Fire Quartz Red Metallic" and "Plum Brown Crystal Mica." It will also be offered in Pearl White, Fine Blue Mica Metallic, and Urban Night Blue Crystal Metallic exterior paint finishes. Stella comes in two-wheel and all-wheel-drive configurations and the 660cc engine comes mated to a CVT automatic transmission. With sales growing in Japan for six consecutive month’s, Subaru is beginning to see the potential of the mini series. Maybe they will decide to launch the series in other global markets. In 2008, Subaru debuted an electric car concept based on Stella. The pure electric concept vehicle combined the Stella platform with the electric-drive from the Subaru R1e which uses a TEPCO lithium-ion battery. It could be the perfect platform to launch a new Subaru EV. The 2014 Subaru Stella mini series is catching on in Japan and could be a good new addition to the Japanese automakers lineup here in the U.S. Maybe Subaru needs to venture out and develop their own platform and cut ties with Daihatsu. Would you buy one of these Subaru Stella mini’s with all-wheel-drive?